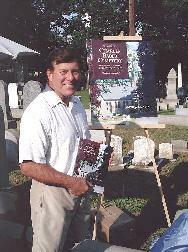 Four years of love and labor by Andrew J. Matta went into the creation, compilation, and publication of a genealogical and historic book about the Charles Baber Cemetery. The book was written and dedicated as a memorial and testament to Andrew’s son, Andrew F. Matta who passed away in 2003 and was laid to rest at the Baber Cemetery. The Book of Remembrance contains a history of the Charles Baber Cemetery, a genealogy of the cemetery, biographical bits and pieces of some of the people buried in the cemetery, and collective writings, poems, and essays. The collective writings are about loss, death, grief, and cemeteries. They were written and offered for inclusion in the Book of Remembrance from community members and from friends and families who have loved ones buried at the cemetery. The genealogy and biographical bits and pieces were researched, complied and cataloged by Andrew J. Matta. The history was written by Carol S. Field. The Book of Remembrance, is for sale for $21.95 if picked up at the office at 200 S. Second St., Pottsville, PA 17901, or $27.95 if you wish to have it mailed to you. The book is in its second printing, with the first printing completely sold out after its introduction at the August 31, 2008, Baber Day celebration. Because the cost of the first and the second publications were completely underwritten by either the Matta family or friends of the cemetery, the full proceeds of this beautiful book go to the Charles Baber Cemetery’s endowment account with the Schuylkill Area Community Foundation. The purpose of the endowment account is to preserve the garden cemetery for future generations to use as a burial place and to enjoy as a garden park.